We have so far covered the brief bio-data, inspirational journey and study plan of UPSC Civil Services Exam 2013 topper Gaurav Agrawal in Part 1. The unedited version of the detailed interview of Gaurav Agrawal (CSE 2013 Rank 1) UPSC Topper’s Interview with Clear IAS is presented in multiple parts, so that aspirants get right guidance regarding the preparation methods, books and coaching. Now straight to Part 2 which explores the books and study-materials referred by AIR 1 for UPSC Prelims. Ancient History I had history optional last year. Medieval History I had history optional last year. Environment (theory + current) Please read my blog post for this. National/international current affairs Newspaper and internet. General Studies Paper 2 (CSAT): No preparation was needed, only attempted 3-4 mock tests. 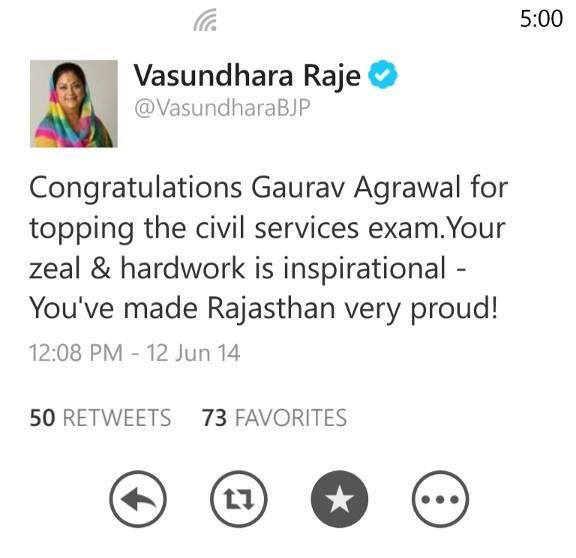 Chief Minister congratulates Gaurav Agrawal for his spectacular result. Prelims preparation is same as mains preparation for common parts of syllabus. This is because even in prelims, UPSC is moving away from information based questions and towards understanding based questions. Continued in Part 3 of the interview : Gaurav Agrawal (CSE 2013 Rank 1) UPSC Topper’s Interview – Part 3. How should I prepare for History as an Optional?